The American Red Cross Bay Area Chapter recognized Lamont and Sheila Gilbert with a "Heroes Award" for their "Acts of Kindness and Philanthropy." 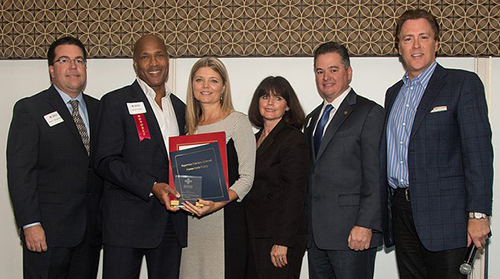 Lamont and Sheila received the award for their creation of the Nicholas Colby Fund in memory of their son – Nicholas – who passed away in 2006 and the thousands of personalized events & experiences they have provided to children, uplifting their spirits. Among many activities, the Fund provides backpacks filled with toys, games, and other goodies to hospitalized children and care packages to their parents. They also host a luxury suite for sick children and their families at Oracle Arena in Oakland to enjoy events such as Golden State Warriors professional basketball, Disney on Ice, Sesame Street Live, and the World-famous Harlem Globetrotters.